An unexploded bomb has been found near a shopping centre, a day after seven blasts killed two people in the city. The bomb - close to the scene of two of the explosions - was defused by police outside the Forum Mall. An investigation has been launched into the explosions, but so far no-one has claimed responsibility for them. India's home ministry said it suspected "a small militant group", while police said the banned Students Islamic Movement of India was a suspect. "Special squads have been formed to find out who is behind the blasts. We have not got any conclusive leads yet," Bangalore's additional commissioner of police MR Pujar told Reuters. 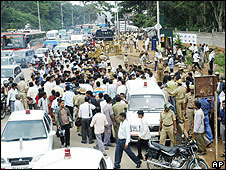 Indian broadcaster NDTV reported that police had blocked traffic to the road where the eighth bomb was found and were searching the area. According to NDTV, a man in his 20s had been seen placing a bucket with the bomb. Eyewitnesses had described him and an artist's sketch was being made, a police officer was quoted as saying. Police said Friday's serial blasts bore similarities to an explosion which occurred at a courthouse in Hubli, a city near Bangalore, in May. No-one was wounded in that blast. Suspected Muslim militants there are being tried on charges of planning attacks in Karnataka state, of which Bangalore is the capital. Bangalore is the IT hub of India, and also has a large outsourcing industry. Many firms have said they have increased security on their premises.